The Duck (Golden Pheasant) 244 Ontario St. The campfire is in the shop. Hopefully just a power-cord issue. Our regular Tuesdays at Highway 61 BBQ have been great – full of surprises. Last Tuesday it was the “two Charlies” (pictured). Nova Scotia Music’s Entertainer of the Year Charlie A’Court and an 11-year old wunderkind whose blues moniker is "Sir Charles". The kid sat in on a couple of blues tunes then asked if he and his teacher Ted could do something by themselves and he proceeded to rip it up on Eric Clapton’s “Layla”. Andy Frank of Roots Music Canada came by with his camera on the Anniversary week-end and you can see his reportage at http://www.rootsmusic.ca. You’ll get the skinny on Highway 61 BBQ (but not the recipe to their secret sauce). Wish I had been there for a gig, but it was for a funeral, regrettably. The night before I headed back to T.O. I decided to drop in to Bourbon Street, one of the clubs that presents blues on a regular basis thanks to promoter Brian Slack and the Montreal Blues Society. I was finding it hard to gather the energy, but when I saw legendary Quebec guitarist Jimmy James on the bill I decided if I want to hear JJ, I had better seize the moment because he rarely plays in Toronto. Arriving at the club I encounter the Montreal Blues Society table with a couple a familiar faces from the MBS “hospitality suite” at the Blues Summit a couple of years back. It turns out that Brian S. had to spin a little magic when the bass player was in a car accident and he had to rustle up a rhythm section – apparently the new bass player arrived halfway through the first set. The front man was a barrelhouse boogie piano player. The cynical Toronto blues person would say we’ve got a hundred guys in our town who can do that...but then, can you really have too many barrelhouse boogie piano players?? While we’re talking about Quebec, I got a news flash that there was a feature film being shot on the life of Gerry Boulet, lead singer of Offenbach. How often does a Canadian blues guy get immortalized in a feature film? 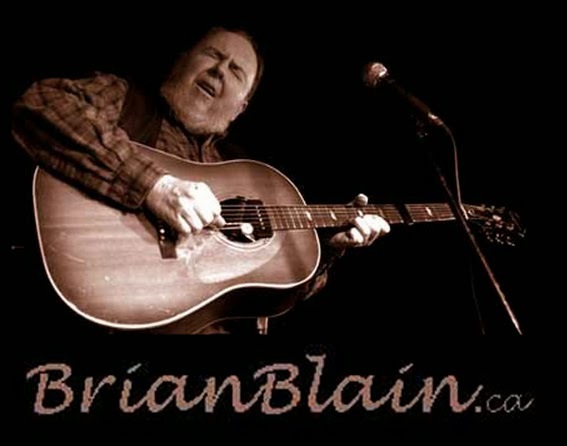 I actually sent a “tweet” on that (you can follow me on Twitter by going to www.BrianBlain.ca. The one story I remember about Offenbach will not be unfamiliar to a lot of blues bands around the world. Offenbach was seconded to back up Chuck Berry at the Montreal Forum. Chuck usually traveled alone and picked up a local band in whatever town and just assumed they would know all his songs (which they mostly did). Of course in Quebec, Offenbach were as big as Chuck Berry so it was more of a double bill, but the guys were thrilled to back up the living legend. Then when it was showtime, Chuck said that he didn’t want the guitar player, just the rhythm section. Offenbach’s guitarist was Jean Millaire, who was a bit of a guitar god in Quebec. I guess a lot of people were disappointed, but that’s how Chuck rolled. ...more songs than even I remember. My oldest musical friend, Sue Lothrop, called the other day and said she was working on an old tune we had worked up together a long time ago (that would be the early 70s). She said it was called “Blown Away Again” and recited a few lines on the phone but I drew a total blank. In fact I denied writing it and when she told me she had me on cassette singing it I still thought it must be somebody who sounded like me. Well last week I was in Montreal (sadly, for the funeral of a cousin who had been a big supporter of my music) and she sat me down and played me the tape and there’s no denying it – it’s me, singing and playing chords I never played before or since. She filled in the blanks and cleaned it up (literally, as she replaced the line “so I had a drink and a toke” - and I guess that line might even explain my memory lapse. So is it still intellectual property if you can’t remember you wrote it? Speaking of old songs, I had a great Blues in the Schools session with the youngest class I’ve ever had to deal with (grade 2 or 3) and when I opened it up for questions, one of the little ones asked me to sing the first song I ever wrote. Well I happen to remember the first song I wrote, though I couldn’t quite get through the whole thing. It’s called “The Family That Cared”...”You went off to war in 1939, came back a hero after serving your time, thought you fought as well as you could, you were very sure that you understood, some of the quys who came back said ‘nobody cares’, but thank heaven you’ve got a family that cares”. It was a song for my dad, but he never heard it. The kids were loving my version of blues history but I restrained myself from launching into the legend of Robert Johnson. The last time I was with a group this age and had them all wide-eyed telling them Robert Johnson had made a “deal with the devil” at the crossroads and how Robert was chasing women until the husband of one of them gave him some poison whiskey...at which point the teacher stood up at the back of the class and gave me a bit of a dirty look. We wrote a song called the “Room 5 Blues” and their teacher recorded it and put it up on YouTube <http://www.youtube.com/watch?v=ClmpaG6OCe4> . You won’t see the kids on the video (privacy issues) but you’ll hear them singing. “Better to have no website than a dormant website” was a good tip. “Be the kind of person that others want to see succeed” - Now there’s a good one. I think that came from networking guru Dan Kimpel. He was hilarious and knew all about networking and he practiced his craft in Hollywood. He went to events with a co-conspirator and they each took part of the room and whoever they met, they said “Have you met my friend Dan? Well, I’ll introduce you later...” His partner knew that if he didn’t introduce her within the first 15 seconds that it was because he didn’t know the person’s name. So she would introduce herself and the name would be revealed. He though that admitting you had forgotten someone’s name was a horrible faux-pas and should be avoided at all costs. Here’s another rule of his: Never poke in on a conversation between two people. However, if there’s 3 or more, jump right in. CMW got it right when they had a website that was able to display a last-minute late-night set by one of the “buzz bands”, Woodhands. Anyway I made a point of catching them and they were quite phenomenal. On the down side, CMW burried what to a large community would have been one of the most popular shows, turntablists Rob Swift and Mistah Sinista). According to my son the DJ, these guys are considered the top players in the land and have been for ten years. Not only were they under-promoted b ut their listing in the official printed programme guide was wrong. Seeing them close up doing their turntablist tricks was jaw-dropping. Tonight I was supposed to Open for Alfie Smith at the Free Times but the way I heard it, Alfie ended up opening for a big show in Hamilton (turns out it was April Wine). Who’s to say which would be a better payday. There was not a big crowd at Free Times. Alfie’s last minute sub was a wonderful singer called Laura Aidanblaise. We swapped CD’s (always a delicate bit of backstage etiquette – when you ask someone to swap you put them on the spot...) We were done at ten so I headed over to Jerome Godboo’s regular Thursday at the Delta Chelsea. Jerome had invited me to come and sit in. I should know these things – being the (barely)managing editor of MapleBlues – but Fathead was filling in for Jerome that night and I figured I’d just brought my guitar for nothing. But then, talking to the boys on the break, Al said he had called me up to the stage but I guess I was in the washroom. Anyway I did make it up in the next set and did a couple of tunes. Wow, sitting in with Fathead...we’re in the big time now! It’s great that the Delta (the biggest hotel in the city) has supported the blues with this regular Thursday night of blues for a year now (they call it the “Delta Blues” of course). I would hope that blues lovers from out of town would make the Delta their hotel of choice in Toronto. Hey, I think I just wrote a commercial...haven’t done that since my ad-agency days in the late 60s. Day One: I take the stage in the back room of the Willow and after the first song I realize my shoes are stuck to the floor. Then I'm stepping up and down and the audience is breaking up with laughter because I'm making these crazy sticky sounds. I couldn't continue with that and I didn't want to inflict it on the next group so I got the waitress to take a moment to pass the mop. Mose Scarlett says I really "mopped up" at Winterfolk. Day Two: This was a breakthrough. I got up at Marg's set and sang "What A Wonderful World" I don't think I've ever got on stage and sung without a guitar in my hands! Day Three: The Campfire was a blast and now I just played a set with Mose Scarlett. I was playing bass and I believe I experienced sheer bliss (interspersed with moments of sheer terror - like when the key changed!). And even though there were a few boo-boos, I love playing bass with him. I'll be joining him again at The Black Swan tomorrow at 5pm. I'm doing a solo set at 3pm. Day Four: Lots more music and camaraderie, backed up Mose again and did a good solo set with a great audience - including some friends who had never heard me play. I love it when I can provide a pleasant surprise.